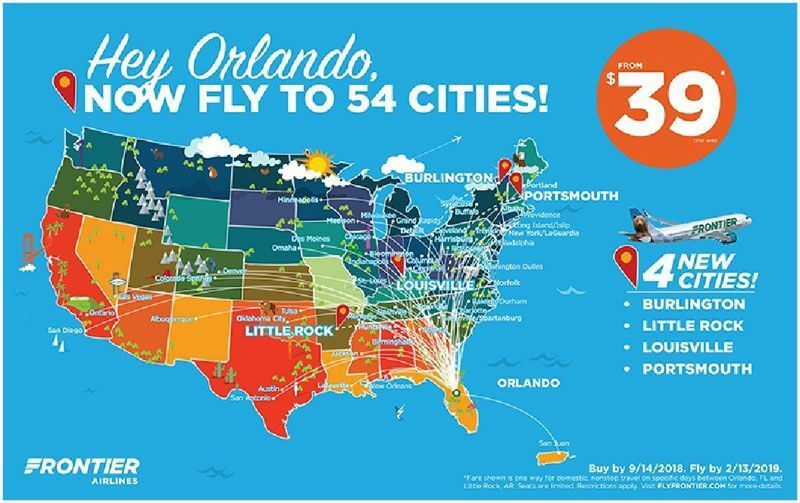 Frontier Airlines will again expand its signature low-fare service at Orlando International Airport (MCO) expanding to 54 nonstop destinations, the most offered by any airline at MCO. Beginning this fall, Frontier will begin the only nonstop service to Burlington, Vt., Portsmouth, N.H. and Little Rock, Ark, and the only nonstop low fare service to Louisville, Ky. The airline is celebrating the news with fares as low as $39 each way. These new routes will be flown on the Airbus A320 aircraft. Frontier flies one of the youngest fleets in the industry, the Airbus A320 Family of nearly 80 jet aircraft. With nearly 200 new planes on order, Frontier will continue to grow to deliver on the mission of providing affordable travel across America. Frontier’s young fleet also ensures that the company will continue to keep fares low and that customers will enjoy a pleasant and reliable experience flying with the airline. Frontier is focused on more than low fares. The carrier offers customers the ability to customize travel to their needs and budget. For example, customers can purchase options a la carte or in one low-priced bundle called the WORKSsm. This bundle includes refundability, a carry-on bag, a checked bag, the best available seat, waived change fees and priority boarding.